That’s right, now the entire 4-book Starstruck series is available for your listening pleasure! If you were holding off until you could binge-listen to the whole series, wait no more! 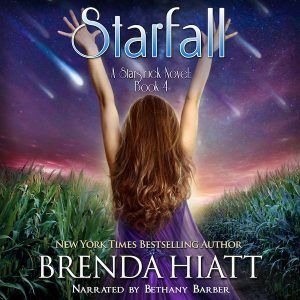 Like the other books in this series, Starfall was narrated by my singer/actress daughter, Bethany Barber (who also happens to be a huge fan of the series, lucky me!) Currently, she’s finishing up the narration of Fractured Jewel, the “bonus” novella I’ve added to the Starstruck series, and is already reading my (unedited) copy of The Girl From Mars in preparation for recording it shortly after it releases June 13th. I’m incredibly pleased to have all four books in this series finally available in audio and hope my readers–and listeners–will be pleased, too. Don’t hesitate to give me your feedback or leave a review wherever you buy your audiobooks! Omg I love your books still wondering where you got the inspiration…love Samantha. I was listening to the audio book of Star Fall and noticed it had some extra text being read that was not in the Star Fall book…..I even checked my ebook of StarFall…that book starts with Sean carrying her back to her room after she sort of half passes out. Also, I guess since its so new, it hasn’t integrated with immersion reading yet as I can’t read and listen at the same time…well, it doesn’t have the highlighting as the book is read (immersion reading that is). Hi, Elizabeth, and thanks for posting! I wonder if maybe your ebook is missing a bit at the beginning? Starfall should begin with a repeat of the last line in Starbound and then continue from there. Does your copy of the ebook not start that way? For the listening/reading integration, someone else mentioned that it apparently hasn’t yet been Whispersynced–but that’s something Audible/Amazon does that I have no control over. I’m hoping they’ll do that soon!